In her wonderful book, “The Invisible History of the Human Race,” writer and journalist Christine Kenneally conveys how your life is part of a thread of life that extends both backward and forward in time. And it’s DNA – which is both the recipe for life and a record of it – that offers the thread linking the past, present and future. Kenneally didn’t write her book to be played off Wade’s, but her story illustrates that human behavior and culture isn’t just about biology. It’s all much more complicated than that. But your DNA gives you insight that you wouldn’t be able to know otherwise. Indeed for many, using genetics is the only way to dig into a past that was erased by the Holocaust or slavery or simply not knowing ones parents. The book isn’t just about looking back and self-exploration, Kenneally also tackles the science and gives us a quick tour of the uncomfortable history of eugenics, both in the United States and in Nazi, Germany. But she also quotes from Wendy Roth, a professor at the University of British Columbia, who notes that DNA testing might do more toward bringing people together by showing us how much we have in common. “This kind of testing seems to make people more aware of how much racial mixing has gone on historically,” Roth said. Kenneally is at her most interesting when she explores the stories revealed by delving into our DNA. She marvels at how genetics can confirm or alter what we know about our identity and ourselves. It’s also can reveal more about the human story. 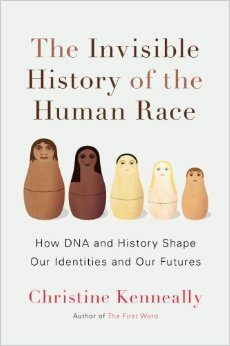 “If everyone had his DNA analyzed, and that information were linked to everyone’s historical information, it would be the nearest thing to the book of humanity,” Kenneally writes.